I've just noticed with images - When importing an image sometimes when I click on an image, say to duplicate or move it, I keep getting the right click menu. I keeping clicking on the image and I keep getting the right click menu, even though I'm not use a right click. Second issue - I'll have, say, 6 images on a page. I want to move them all so I will select one and hold down the shift key to select the others but I might be able to select one other but have trouble selecting all the others. The select keeps moving around. I can't say I've ever had this myself. Are you using a mouse or touchpad? It sounds like you're having a general input issue with Affinity which could be dependant on what you're using to click. Do you have any software installed that handles shortcuts? I’m using both a trackpad (iMac) and a tablet but the right menu was occurring with the trackpad. I’ll have to check in system prefs and see what may be going on. 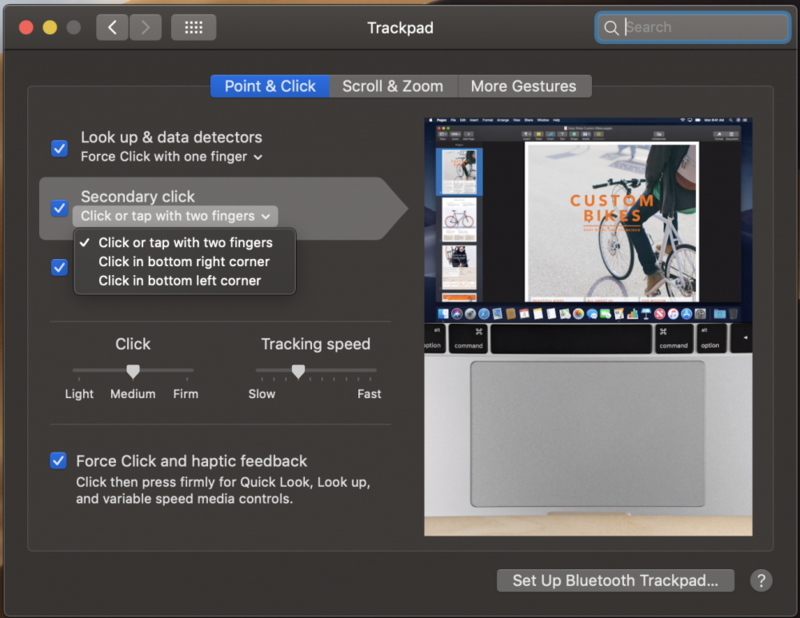 Usually with the Mac trackpad two fingers activates the right click menu. I was only using one finger. Have you changed any of these? Yes, I checked and I am set that way - Click or tap with two fingers. Thats why I'm puzzled.